Downtime optimized DMO will reduce the downtime of the DMO procedure. It integrates a technology to enable the migration of selected (big) application tables during uptime processing of DMO, thereby reducing the downtime migration time. During uptime processing, the source system is still available for end users. End user activity in the system may change application tables, so if these tables have already been migrated to the target database (SAP HANA database), the changes have to be recorded and transferred to the target database as well. A dedicated technology offers the required procedure to set triggers on the respective application tables to create log entries, frequently analyze the logs, and transfer the delta to the target database. We have pilot projects running and accept a limited number of additional Projects. The Projects must be conducted by SAP, and the SAP colleagues have to Register for the procedure by creating an SAP internal incident. Check SAP Note 2442926 for Details. The shadow repository is copied from the source database to the target database, the SAP HANA database. Note that the shadow instance is still existing, although currently not used, but not deleted as in the standard DMO. Now the trigger for the selected application tables is set up, and the initial transfer of the triggered tables starts. The triggers are set by SUM internal technology. that uses the target version kernel for the SAP HANA database. This instance is called TMP instance (temporary). Downtime starts, now the remaining delta of the application tables are migrated. Now the remaining application tables (that have not been triggered) have to be migrated as in the standard DMO. The target kernel is now applied to the PRD instance, the system is started to allow the update of the application tables. This is still business downtime. Once the application tables are updated and the procedure is finished, the system is available again. Very interesting and eager to explore it. It was nice meeting you at TechEd and ITM360 was a great session. Looking forward to use it at more customer environment. looking forward to trying out this DMO with DT-Minimizing. I am currently involved in a migration project. The project scope is migrating from MSSQL 2012 to ASE 16.0. While I am reading the guides I noticed that SUM has new feature called DMO and when I got deep into it, saw that DMO can only be used for target database ASE on request (min. required NW release must be SAP_BASIS 740 SP9). My Business Application Suite version and SP levels are: ERP EHP6, SAP_BASIS 731 SP07 and SAP_ABA 731 SP07. In this situation what are your suggestions to continue with? I would appreciate if you could advice. well, if the version and SP levels you listed are the start release, you may consider to reach a target level that is supported by “DMO with target ASE”. As far as I know, SP7 for EHP7 of SAP ECC 6.0 may be coming out soon, and it will be based on SAP_BASIS 7.40 SP09. If this does not fit, you will have to use Software Provisioning Manager. 1- you say the unicode conversion is not possible? it is possible with SLT as long as RFC connections are used to read/write the data. SLT can also cluster/pool/INDX tables very well..
2- BW are not supported? The majority of replication scenarios for SAP HANA are using the data replication into BW on HANA. 1 – yes, for downtime optimized DMO, is currently not possible to include the unicode conversion. Although the SLT technology is capable to cover the unicode conversion, the integrated usage in DMO does not (yet) allow the unicode conversion. 2 – BW is not supported as a source system for downtime optimized DMO. I guess the replication scenarios that you refer to have an ECC backend as a source, where changes are replicated into BW on HANA – correct? This is different to the scenario where BW as a source would require triggers. if certain NW ABAP based products like BW or SCM (in case BW functionality is used) are not supported as source systems then please document this accordingly, also in the “Restrictions and Limitations” section of the related SAP note. Currently, this is not transparent. I had a question on the usage of SLT with DMO of SUM. You mentioned to select DMIS addon as part of stack. What if our landscape already has the latest – DMIS SP08? and we wish to use DMO of SUM to update/Migrate ? Do we manually setup SLT config naming the schema as SAPSID , replicate the tables we need manually , and later start SUM to update/migrate to HANA ? for downtime optimized DMO, the DMIS AddOn is used, but we do not use the setup like for SLT, so there will be no separate SLT replication server. The DMIS AddOn may or may not be installed on the source system, meanwhile SUM SP13 can handle both situations. If your landscape is using an SLT replication server, this will not be used for downtime optimized DMO. So no SLT setup required on that server. Thanks Boris. I shall get in touch with SAP to see if we can get this option for our migrations. Thanks Boris – Very good content. 1) should we use Source system as SLT ? 3) if yes SLT configuration replicate data dictionary tables to target schema as default – is that ok to overwrite SUM transfer tables ? May i know the estimate date for GA? Also, how many customer had registered themselves for using this tool and what’s the outcome? IS the Optimized DMO a consulting offering from SAP.? Or it is GA available for customers with SUM SP13? downtime optimized DMO is still “available on request”, and we can’t estimate when it will be made general available (GA). It is not necessarily a consulting service: “available on request” means that customers / partners have to request the usage, and we will decide on project details as well as development capacity on the request. However, it is not a bad idea to have experienced SAP consulting colleagues involved. I am trying to get the below note to understand optimized part for DMO. However, it is not yet released. this note is not released for customers, that it why you cannot access it. The Downtime Optimized DMO is very much clear with your blog, thanks again for explaining in detail. Basically, for one of our clients, we proposed in-place DMO migration for their ERP system (ECC6-EHP5) on DB2 with size of 13 TB. The client only has the 24Hrs downtime window, and hence we were exploring the Optimized option. However, client wants to be sure the Optimized DMO is not a consulting offering. Boris I have tried opening an incident under component BC-UPG-TLS-TLA but I received a response that it was not the appropriate area. Is there a different component that needs to be used? Thank you for the blog. This was very informative. it is the right component, and the incident will be handled now. I opened a ticket under BC-UPG-TLS-TLA and have been going back and forth with SAP. They are saying that there is no pilot anymore and I was referred to the standard DMO note 2161397. Can you please help us with this. I can provide the message number. apparently, the processor of your incident is not familiar with the procedure that enables you to take advantage of the “Downtime Optimized Database Migration Option” of SUM. Please send the incident back and ask for forwarding it to the Development Support level. It’s not SAP note 2161397 but 2005472 that needs to be considered in your case. Thanks Ronald…I just sent back the incident and asked the processor to forward it to Development support. Will let you know how it goes. 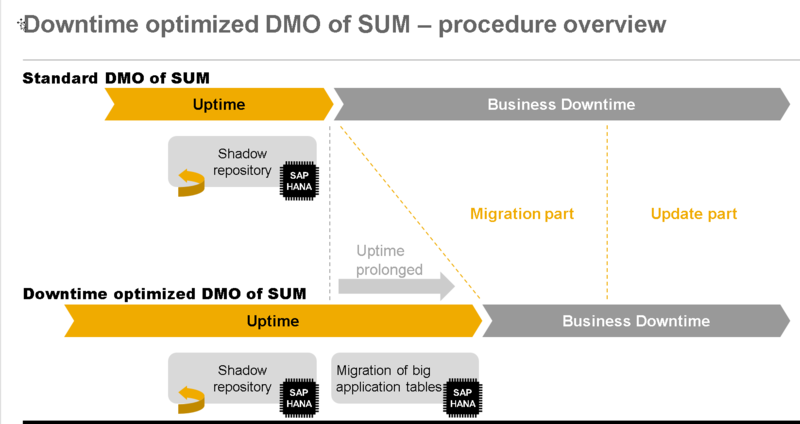 Could you please clarify for us if the near zero downtime offering for HANA migration from SAP and the downtime-minimized DMO described here are two different scenario. not sure what you are referring to as “near zero downtime offering for HANA migration” – is it the nZDT service offering? Anyway these are two different technologies. Hi Boris, I opened an mesg126683 in BC-UPG-TLS-TLA regarding the pilot of downtime optimized DMO, and attached all the info from our last normal DMO run in POC HANA. still no response from support. Is this the right queue? we have ran more 4 migration iterations for DMO run on a 20 TB ECC 6 EHP6 oracle system migrating to HANA. We have observed very poor performance during the first 12 hours of the migration where just around 2 TB of the data gets migrated from EUMIGRATEDT.logs. In the next 30 hours or so we get around 700 GB/hour throughput. We have tried many different options for optimize the migration , i.e. increasing /decreasing the table split options during split and increasing /decreasing the number of R3load processes during migration but that is not helping the speed up of the migration. We have observed the during this first 12 hours the CPU IO on the oracle DB server is always more than 60% and we have observed more than 100 blocked processes in SAR output. Keeping all these in mind, we want to explore possibility of migrating APP tables during uptime during this method the blog provides. 1. My understanding is that this pilot service to analyze the tables by SAP development support is free of cost ? 2. How much time does the SAP development support takes to get engaged to analyzie our scenario and recommend solutions around tables which can be migrated online. 3. After development support provides recommendation, is there any further involvement for SAP professional services during the rest of the project duration. thanks for your question. I’d like to take this opportunity to clearify some aspects. 1. This is not a pilot service, it is a feature that is piloted. The participation is not free of costs, as SAP colleagues from consulting and/or Active Global Support will have to be involved and will have to be paid by the customer. 3. The involvement of the SAP colleagues is throughout the complete project, not just during a kind of analysis phase. My recommendation is to analyze your scenario thouroughly, and of course I can recommend to involve SAP colleagues for this. But this is not bound to the “downtime optimized DMO” feature. Do you have any plan to support System Conversion scenario? we do have plans to reduce the downtime of a system conversion to SAP S/4HANA: it is called “downtime optimized Data Conversion”. The idea is similar: do more during uptime to have less downtime. Technically it is a bit different, and more ambigious. I will try to post more on that soon. I’m looking forward to seeing your new entry!! thanks for this article. It gives a very good introduction about this topic. I still see the note as not released and no other articles regarding this. Is this still valid? What is the status now for downtime optimized DMO? I have found note 2153242 – Estimation of table sizes and downtime for SUM DMO with SLT that gives a sort of starting point but nothing more. The status is still as mentioned: currently we do not accept further pilots due to the existing work load. I’d be glad to start with new pilots begin of next year, and will update the blog accordingly, so stay tuned. We are eagerly waiting for optimised dmo to be generally available. This will help many SAP customers to avoid longer downtime for hana migration of production environments. When we provided UPGANA.xml in sapup_add.par file in /usr/sap/<SID>/SUM/abap/bin/ it was not accepted by SUM tool. you can provide the UPGANA.XML file from a previous run by simply putting it into the download folder. If the error persists, please create an incident on component BC-UPG-TLS-TLA. Files were copied to the download folder however we received same error for each run. We tried reusing UPGANA.xml from 3-4 mock runs and every time same error. Also we reused these files for same system with same SID. “MIGRATE_UT_DUR.XML & MIGRATE_DT_DUR.XML” were taken successfully by SUM tool. Problem as mentioned above occurred for “UPGANA.XML” file only. Could difference in DB size or table growth be the reason behind this? there is no need to use SAPup_add.par for both the duration files or the UPGANA.XML, as SUM will consider these automatically if found in the download folder. Just want to check with you is the known limitation updated for SUM SP19? Is BW or other NW products supported for downtime-optimized DMO? Referring to the big picture of SL ToolSet 16, it says BW is supported? thanks for asking: SAP BW is not supported for “downtime optimized DMO”. For SAP BW, the Delta Queue Cloning is the approach to optimize the downtime. We will have to adapt the slide in the referenced picture. Thanks for the info! Much appreciate. Is this option still running as Pilot or GA is there? thanks for asking. I have updated the blog now. The procedure is not GA.
We accept a limited number of additional projects, as mentioned in the blog. Since DMO is not supporting Unicode Conversion, does Downtime Optimize DMO work on non-unicode source too? DMO is able to cover the Unicode Conversion, but not for target systems based on 7.50 and higher. Concerning “downtime optimized DMO”, one of the requirements is that the target system is based on 7.50 or higher. Yes, the conclusion is that “downtime optimized DMO” requires a Unicode source system. Only if the target is >= 750, source system need to be on unicode. And noticed from 2442926 – Prerequisites and Restrictions of downtime-optimized DMO, allowed target release for downtime optimize DMO was changed to 750 or higher, previously i believe 7.40 was supported. Can you confirm for the scenario “System Conversion (targeting SAP S/4HANA)”, is downtime optimized or nzdt scenario possible? or standard dmo is the only option? thanks for asking. I plan to write a blog on this aspect in January. for the System Conversion, NZDT is available, see SAP Note 693168. Downtime-optimized DMO is not applicable for the System Conversion. We plan to pilot “downtime-optimized Conversion” for the System Conversion soon – but only for the case that the source system is not yet on SAP HANA database. Thank you for confirmation. Awaiting for your blog on this. Happy X’mas.